Another Sunday and I've been trying really hard not to work today. Dealing with not being in Australia with Steve Ignorant's tour - relief that I can get on with the very urgent work at Southern, but also sad not to be there for Steve and to be missing (what I hope is) all the fun. Seems I can't be happy no matter what I do! So today I am teaching myself how to podcast. About two months...no, wait - FOUR months ago, Damon bought me an amazing USB mic (Yeti Pro, more on that later I'm sure) and I've finally gotten it out of the box and I'm trying to figure out GarageBand. Not bad so far, I've made theme tunes for two podcasts (a personal one, Savage Pink - and a work one for Southern). However I'm now caught up in the drama and having twelve kinds of performance anxiety. I reckoned I'd start with my personal podcast - easy right? No one will even know it exists! Yeah well, wrong... I've spent about 6 hours picking out 15 minutes worth of songs. It's the usual Allison stuff - if I'm going to do a podcast it's going to be the best podcast anyone living or dead has ever done now or forever into the future. Example? Choose song. GREAT SONG! Wonder when that song was recorded, who wrote it, what that unintelligible lyric is, did anyone ever cover it, is there a story behind it.... At this rate I may produce one podcast per year. While I've been spinning my wheels I have enjoyed myself though. Spent probably a good 90 minutes revelling in the genius of Bo Diddley. Actually this was prompted by hearing George Thorogood's version of "Who Do You Love" on the radio t'other day - for Americans of my generation, an FM radio classic, and an undeniably good version of the song. But DAMN what a great lyric. I walk 47 miles of barbed wire I use a cobra snake for a necktie I got a brand new house on the roadside Made from rattlesnake hide I got a brand new chimney made on top Made out of a human skull Now come on take a little walk with me, Arlene And tell me, who do you love? Who do you love? Who do you love? Who do you love? Who do you love? Tombstone hand and a graveyard mind Just 22 and I don't mind dying Who do you love? Who do you love? Who do you love? Who do you love? I rode lion in to town, use a rattlesnake whip Take it easy Arlene, don't give me no lip Who do you love? Who do you love? Who do you love? Who do you love? Night was dark, when the sky was blue Down the alley, the ice-wagon flew Heard a bump and somebody screamed You should have heard just what I seen Who do you love? Who do you love? Who do you love? Who do you love? Arlene took me by my hand She said, "Oohwee Bo, you know I understand." Who do you love? Who do you love? Who do you love? Who do you love? An incredible amount of cool jammed into one song - even if it had been written yesterday, never mind in 1956 by a boy from Mississippi. Bo was about as good as it gets. The Originator, The Black Gladiator, a true legend. 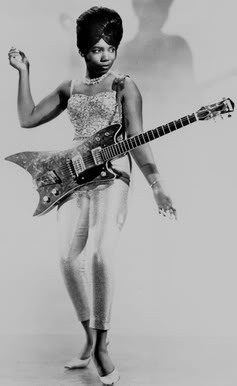 And in the course of my shameless meandering across the interweb, I was reminded of Peggy Jones, aka Lady Bo, Diddley's first female side-kick, who he apparently met on the street when she was 16. How cool is she? And still going strong, playing gigs and recording. Here's a clip of Bo and Lady Bo I found today. Meanwhile, I've been roasting a chicken. Damon loves my roast chicken (learned from Nigella Lawson's How To Eat, to give credit due). Billie also loves chicken, probably more than anything in the world - and therefore when I roast one, she is driven to distraction by the wonderful smell. It's heartbreaking to see her face, looking up at you urgently, and her obvious attempts to be THE BEST BEHAVED DOG IN THE WORLD, in the hopes that you'll let her have the chicken. The whole chicken. She won't get the whole thing, but she will benefit greatly once we've had our fill.